SE’s heavy-duty Emergency Sleeping Bag is tear-resistant, reusable, and comes with drawstring carrying bag for your convenience—a great addition to your gear for hiking, camping, hunting, boating, fishing, survival and emergency kits. SE is committed to providing the customer with the best source for value. You will enjoy the quality, function and usefulness our Emergency Sleeping Bag with Drawstring Carrying Bag has to offer. SE’s heavy-duty Emergency Sleeping Bag is tear-resistant, reusable, and comes with drawstring carrying bag for your convenience—a great addition to your gear for hiking, camping, hunting, boating, fishing, survival and emergency kits. PRODUCT FEATURES: Dimensions: 3 ft. x 7 ft. Weight: 5.8 oz. 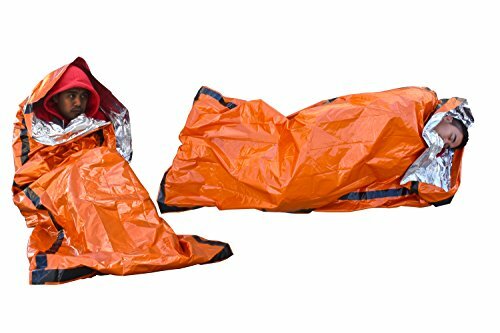 Aluminized PE interior for insulation & warmth Heavy-duty material Reflects body heat Reusability Tear resistance High-visibility safety orange color Drawstring carrying bag IMPORTANT: Avoid getting counterfeit items. Genuine SE products come with our SE logo on the packaging. SE is committed to providing the customer with the best source for value. You will enjoy the quality, function and usefulness our Emergency Sleeping Bag with Drawstring Carrying Bag has to offer. SE is a registered trademark protected by US Trademark Law. Amazon: http://amzn.to/1J1ZU4R Follow us on Twitter: https://twitter.com/PrepperJunkie. For the full information, please find on: http://amzn.to/1l4zFPH.